Nevermore: Who says students don't learn stuff at University? Who says students don't learn stuff at University? The following announcement was stolen from a noticeboard in a coffee shop on my campus, stowed away under my jumper while I scurried through the rain, and is now here for the personal amusement of many. It is a genuine informative artifact, and has not been altered by me in any way. 'Cept the raindrops. The best part, is they even sprinkle little apostrophes on top of the paninis, for an extra 20p. 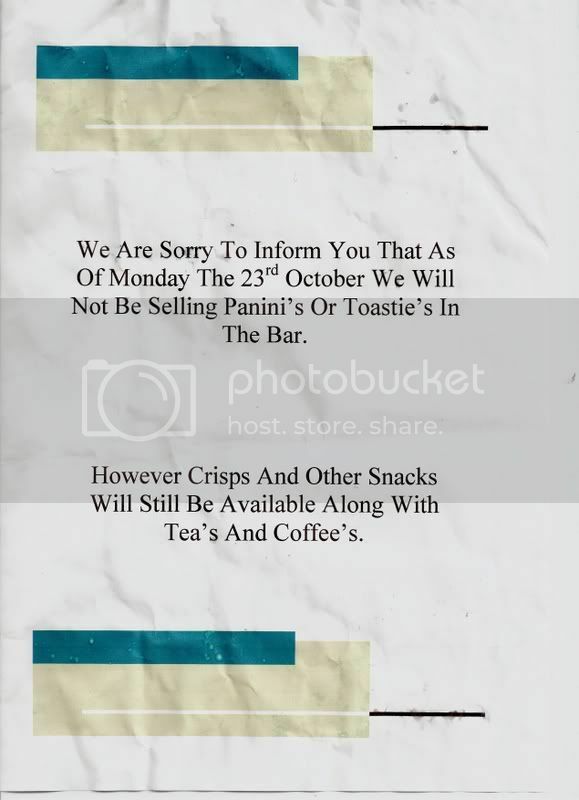 What I want to know is, howcome the teas, coffees, paninis, and toasties get apostrophes, but the crisps and snacks don't.